Boats in the fifth annual Nopper Marine Poker Run on Saturday, 9/8/18, are lined up at the Woods Hole Houseboat, which was stop #2. Photo courtesy of Mike Cordeiro. 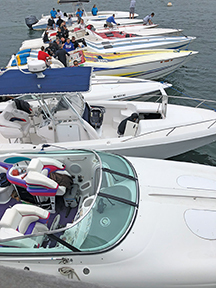 Angry Seas greeted the boaters in the fifth annual Nopper Marine Poker Run on Saturday, 9/8, but that did not deter 24 boats from participating. The boats met at West Island Marina in the morning, then made five stops in Buzzards Bay starting at noon. At each stop, the boats picked up a playing card and the hands were compared to pick the winner. Boaters said the seas were as high as eight feet between stops. 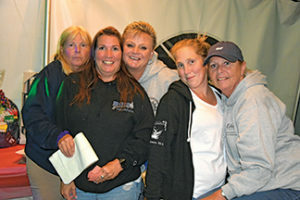 First prize went to Heatwave, from Quincy, and they donated the $1,000 back to the cause. Best Looking boat was Wilder, and Best Looking Crew were Jake and Kendra Galary. Proceeds benefit Better Commu­nity Living’s Children’s Program. 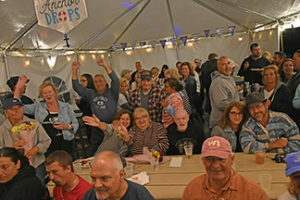 After all the cards were counted, the whole gang gathered in the tent at Off The Hook for raffles, and music by Jimmy James & Nate Pires. Organizer Heidi Pereira said they raised $13,500 (before expenses) this year. It was down $1500 from last year, but is even more impressive considering that last year there were 34 boats, and this year there were 24. The weather was the reason for fewer boats, said Ms. Pereira, but people made up for it with their generosity in other areas. 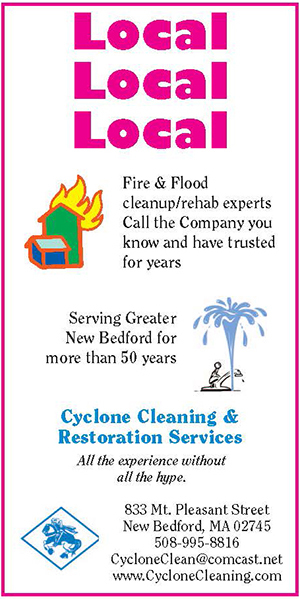 Contact Heidi at heidi_pereira@bettercommunity.com for more info. L-R: Wendy Perotta, Terri Richard, Heidi Pereira, Kim Belong, and Glenda Cordeiro at the fifth annual Nopper Marine Poker Run at West Island Marina on Saturday, 9/8/18. Photo by Beth David. 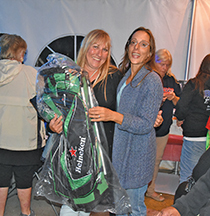 Raffle prizes included a wide variety of items, including this golf bag at the fifth annual Nopper Marine Poker Run on Saturday, 9/8/18, at West Island Marina. Photo by Beth David. 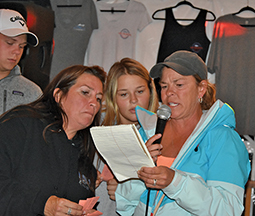 L-R: Terri Richard, Veronica Sullivan, and Caryn Sullivan read off raffle numbers at the fifth annual Nopper Marine Poker Run at West Island Marina on Saturday, 9/8/18. Photo by Beth David. And the crowd goes wild at the fifth annual Nopper Marine Poker Run at West Island Marina on Saturday, 9/8/18. Photo by Beth David.